This is a review of Goose Creek Candle Wax Melts from March 2019. 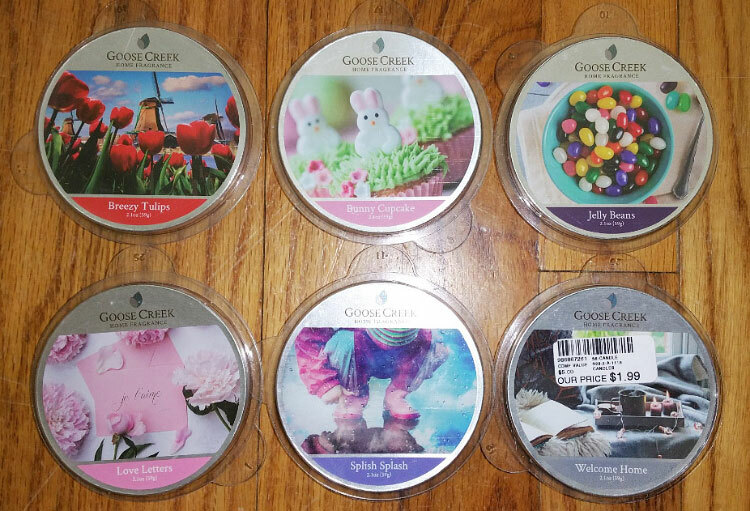 A couple of these are Easter and Spring themed scents. And as usual, these Goose Creek wax melt scents are fantastic. Goose Creek Candle wax melts and candles can be found on their website at goosecreekcandle.com, and at some stores like Gabe's and Tuesday Morning. This smells like pink sugar, but it's not as sweet and perfumey, and it has a more fruity note that might include apple and/or peach in addition to the usual raspberry that pink sugar scents have, as well as a floral note. Looking at the notes, I'm way off; there are no fruity notes in this one! But I definitely do smell fruit that makes this smell kind of like a rich, sweet peach or apple blossom scent. Melted, I definitely smell more of the fruity note, kind of like strawberry, and it smells a bit similar to the Breezy Tulips scent. I love this scent! And it's nothing like the old ScentSationals Love Letters (they only share the same name).